Pastor Chris and Lady Gwen fell in love on their second date. That was back in May of 1987. They were married that September and since then, they have been working and serving God as their Father, leading a family in Christ, and building up the church in Spirit. If you like a godly woman whose mentor is the virtuous woman of Proverbs 31, then you will love our Lady Gwen. And if you like the straight truth from a godly man who preaches a noncompromising gospel, you'll like Pastor Chris. 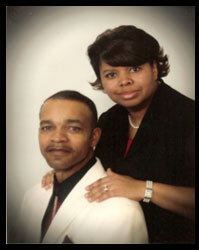 You have a special invitation to come and meet our Pastor and First Lady and see for yourself.